The StereoCam™ was developed at HinesLab to be the most versatile dual-camera 3-D rig available. Steve Hines is the originator of this over/under-format 3-D camera rig. A patented internal mechanism allows independent adjustment, during the shot, of the convergence distance, and the interaxial spacing. The Interaxial spacing (controls the amount of 3-D depth) can be adjusted during the shot without affecting the convergence distance. The Convergence distance (moves objects in and out) can be adjusted during the shot without affecting the interaxial spacing. Fig. 1. At a short convergence distance. Fig. 2. At infinity convergence distance. The fan-shaped radial lines represent light rays in the scene directed toward uniformly-spaced pixels on camera sensors. Fig. 3. When cameras are toed in, points common to both cameras in the subject space (indicated by the Moire patterns and blue line) form a concave cylinder. When the movie is projected on a flat screen, the subject space is pushed farther back on the sides, warping the scene into a convex cylinder. These diagrams may be reproduced and used, conditional on providing the following credit: "Stereoscopic Depth Distortions, S. Hines, Jan. 1987"
Interaxial: 0 – 4.5 inches. Convergence: inf. – 4 feet. Motorized operation with remote control. Full manual operation available without dependence on electrical power. Minimum focal lengths: 21mm on 35; 40mm on 65; 7mm on HD (depending on aspect ratio). Shipping case: 27 x 36 x 35"H. Shipping weight: 185 lb. Rental Rates: Please contact HinesLab for current pricing. 3-D Video Viewfinder Shipping case: 25 x 27 x 35". Shipping wt: 125 lbs. Recommends minimum convergence distance after entering lens FL and interaxial spacing. Color monitors in the 3-D Video Viewfinder show scene depth, and any objects which float off the screen, and alert you to images which break frame. Adjustments can be made on the remote control while viewing through the 3-D Video Viewfinder until the shot works. Built-in VCR's play back in synchronized 3D. Save time and money by viewing the shot in 3D before striking the set. In the editing room, the 3-D Video Viewfinder becomes a valuable post-production tool by allowing a preview of left and right tracks before printing. "Haunts of the Olde Country" shot in Scotland in 1992 with CP-65 cameras by Infinity Filmworks for Busch Ent. Keith Melton, director. 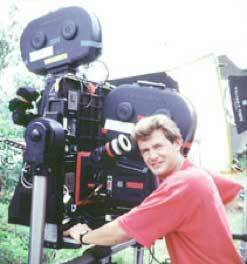 Peter Anderson, DP. "Pirates" by Renaissance Entertainment for Busch Entertainment, Ohio, 1996 using CP-65 cameras,hanging from the Cartoni head, left picture. Right picture: Peter Anderson, DP, left, and Keith Melton, director, right. supported here by the Cablecam. "Encounter in the 3rd Dimension"
"Intel Delivers" shot with Sony BVP-7 cameras for Delphi Productions, July 1999. Left picture: Joe Ward, AC, and Rick Wise, DP. Right picture: Steve Hines, 3-D consultant. supported by the Cartoni head, Feb., 2002. Diego, CA, July, 2001. Joe Dante, director. Sept., 2003. Bob Gothro, director. 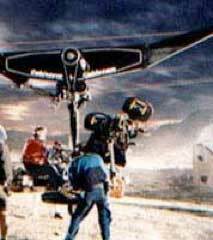 "Dreamchaser" for General Motors by RFG Productions with Sony HDC-950 cameras, supported by the Vinten 70 fluid head, Feb., 2004. Bob Gothro, director. Mark Karavite, DP. steve@me.com, 3-D consultant. The 3-D Video Viewfinder, right, was used extensively during shooting to check depth and confirm settings. "Haunts of the Olde Country" by Iwerks Entertainment for Busch Entertainment. "Loch Ness" by Iwerks Entertainment. "Honey, I Shrunk the Audience" for Disney/MGM Studio Tour in Florida, & Disneyland in Calif.
"Ahead of Time" by Sony Pictures. "Encounter in the Third Dimension" by nWave Pictures. "Intel Delivers" by Delphi Productions. • "I have a lot of faith in your system and having used it on both Bugs and Robots I wouldn’t consider anything else." Chris Parks, Image Quest 3-D, England, 2008. • "The rig was a joy to use and extremely straight forward. Thank you very much!" "Your rig was great to work with last time and would definitely be my first choice if this gets off the ground." Chris Parks, director, Image Quest 3-D, England, 2004. • "Thanks again for the advice and support during pre-production. Your equipment performed flawlessly! 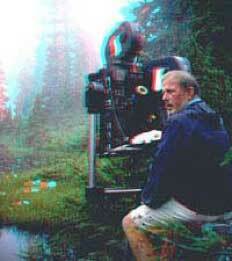 In fact, the 3-D effect was stunning", Alan Hudson, director, CWA, England, 2002. • "It's the best system out there. 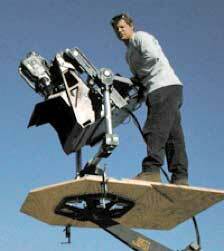 You want to use the best equipment available which will not only simplify your life, but allow you to do things creatively and technically to make a better movie" Keith Melton, quoted in Jan/Feb. Stereo World Magazine, 1998. • "The HinesLab StereoCam™, today's preferred mount for dual-camera 3-D photography, was used in filming the live-action scenes." Don Marren in Stereo World magazine March/April 1994 reference to "Enertopia", directed by Wayne Lehrer, 1993. • "The "StereoCam™ was surprisingly flexible and easy to use. All I had to do was pull convergence, pushing everything back into the screen." Noel Archambault, DP. August, 1992. 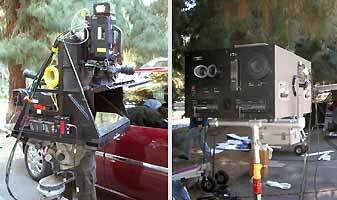 • "The StereoCam™ system simplifies most problems in shooting 3-D films. It's a beautifully engineered and rugged system. Everything 'clicks' into place with amazing precision." Bayley Silleck, Director, 1991. • "Thank you so much for your valuable suggestions and significant contribution to our 3-D film project, "The Time Machine of Dreams." We'll be looking forward to working with you in the future." Bob Anderson for Harper Films, 1990. • "This is just a note to say thanks for your notes on safe convergence… for our project with Harper Films. Your data and explanations have had a profound effect." Kevin Bjorke for deGraf/Wahrman, computer-graphics company for "The Time Machine of Dreams", 1990. • "A very sophisticated dual camera rig. Allows the widest-angle lenses of any 3-D system. State-of-the-art convergence." Chris Condon, American Cinematographer Manual, 7th Edition, p. 534. • 2000, Film Crew magazine, p. 30-33. • 1998, Nov, American Cinematographer "Shooting Star" p5, 9; "3-D Safari", "Concerto for the Earth" p6; "Encounter in the Third Dimension" p17, 20. • 1998, Jan./Feb., StereoWorld, "Busch Theme Park's 3-D Pirates and Haunts", p. 5 & 6. • American Cinematographer Manual, 7th Edition, p. 534.